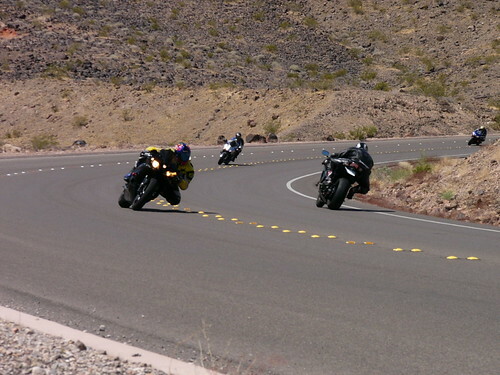 Through a minimal amount of coercion we were able to get 55 motorcycles from 702sportbikes to show up for a group ride today. We rode down the west side of Lake Mead and stopped for lunch at the marina. I’ve uploaded 41 pictures from the day to Flickr. I’ve also got video that I still need to go through. Here’s a picture of Ivan, me, and John from today. Update: Here’s a video cut back to back of Paul running the corners yesterday (the person in the truck he passes is one of us). Update: Here are Kurt and Jason.